There were also many visions that changed significantly over time. 4.6 Problem 6: Why did William Branham not tell the story in Jeffersonville until 1960? 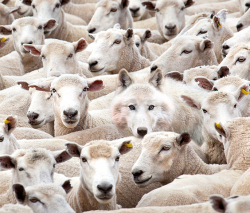 4.7 Problem 7: Why didn't William Branham warn anyone? The video above contains an error in that it indicates that there were no fatalities in the building of the Municipal Bridge. This is in error as, based on research performed by Searching for Vindication, there were 2 fatalities in the construction of the bridge as noted below. As a result, the video will be edited to correct this error as soon as possible. However, please note that the conclusions reached in the video remain the same. William Branham often told of a vision he had as a young child of 16 men falling to their deaths while building a bridge across the Ohio river. Originally called the Louisville Municipal Bridge, the George Rogers Clark Memorial Bridge is a four-lane cantilever bridge crossing the Ohio River between Louisville, Kentucky and Jeffersonville, Indiana, carrying US 31. Construction began in June 1928 by the American Bridge Company of Pittsburgh. It was during this time that William Branham was working as a cowhand in Arizona. He returned to Jeffersonville after he received news that his brother Edward had passed away on June 20, 1929. When he returned to Jeffersonville, the new bridge would have been opened or very close to completion. In 1949, the bridge was renamed in honor of George Rogers Clark. The bridge was rehabilitated in 1958, and is still in use today. La vérité pure et simple sur la prophétie du pont. William Branham's visioen van Municipalbrug in Louisville. We have not been able to find any historic documents or evidence supporting the statement that 16 men died during the construction of the Louisville Municipal Bridge. Here at the municipal bridge. Sister, no doubt you know where the municipal bridge is, don't you, cross from Jeffersonville to Louisville? Twenty-two years, when I was a little boy, just a little bitty lad about five years old, or six years old, when the Angel of the Lord appeared in the bush... You've heard me tell that haven't you, when I was packing water? Well, about two weeks after that, I was playing marbles with my little brother. And I thought I'd got sick, some real funny feeling came on me. And I went and set down by the side of a tree. And I looked down at the river, and there went a bridge, a big, great big bridge going across the river. And I counted sixteen men that fell off of that bridge and drowned. And I went and told mother. And I told her I seen it. And they thought I was crazy or something. They thought I was just at a little nervous hysterical child. And twenty-two years from that time, on the same ground went the municipal bridge across, and sixteen men lost their lives on it. See? Wasn't nothing that... It's--it's God sent it. Your prayers brought it. See? On Wednesday, June 19, 1929, Richard Pilton died after being hit in the temple with an iron crank. He did not drown. On September 10, 1929. Lloyd McEwen lost his footing and fell, landing on a barge below the bridge. He did not drown, but rather, died from the injuries caused from his fall. The research documented on the Searching for Vindication website refutes any claim that the records in 1929 were inaccurate, and that the 16 fatalities were simply not recorded. We would highly recommend those interested in this issue to read the research performed by Searching for Vindication. Our research indicates that many deaths occurred during the construction of the Big Four Bridge, which is a railroad bridge a half mile upstream from the Municipal Bridge that opened to the public in 1895. On December 15, 1893, a construction crane was dislodged by wind causing the supporting truss to collapse which resulted 41 workers falling into the Ohio river. 21 workers died as a result. In William Branham's vision, 16 people died when they fell off the bridge. With the Big Four Bridge, 37 people died in the construction of the bridge. All of these fatalities occurred before William Branham was born. The Louisville Municipal Bridge opened on October 31, 1929. William Branham said that he had the vision twenty-two years prior to the accident. This places the vision in 1907, which is before he was born. However, William Branham also said he had this prophecy when he was either five or six years old (approx. 1914) while playing marbles with his brother. The only things that happened in 1936, which is twenty-two years from 1914, was that the toll on the Louisvill Municipal Bridge changed from 35 cents to 25 cents and the Louisville, a lifeboat anchored near the Municipal Bridge, was relocated downstream. As a result, the fulfillment of this prophecy has nothing to do with twenty-two years from the date of the vision. 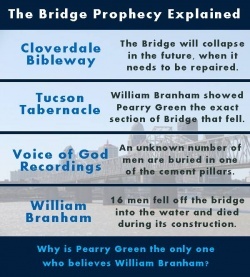 In a phone conversation with Pearry Green, he told us that William Branham stood underneath the Municipal bridge, and pointed out the exact section of the bridge that fell into the river. That is the reason that Pearry specifically points out on the video clip the exact section of the bridge that he said fell into the river and which resulted in the deaths of 16 men. The problem is not in Pearry Green's retelling of the story - he did not grow up in Jeffersonville and had no reason to doubt William Branham. The problem lies with William Branham's prophecy and the story that he used to prove its fulfillment. There is no historic indication that any section or portion of the Municipal Bridge fell into the Ohio river or that anyone died in its construction, other than the two men whose deaths were reported in the newspapers. Problem 6: Why did William Branham not tell the story in Jeffersonville until 1960? We received the following question on our discussion page - "If what the telling of the bridge is true, that there were not 16 victims, how about the local people living in that time? They must have known about the bridge, and why would Bro. Branham tell such story to the local people? They would know if he had made it up, he would be a bad liar". Take a look at the quotes below. Is it just a bit curious that the first time he related the story in Jeffersonville was in 1960, over 30 years after the fact? 30 years after the fact people may remember that there was a big accident on a bridge where a bunch of people died. But 30 years after the fact, they won't remember when it happened or even how many people died. But these people in Branham Tabernacle trusted William Branham. If they did have a bit of a question, would they easily be able to go back and look? Remember this was prior to Google. It would have been a fair amount of work, even if they had a bit of doubt, so they would have given William Branham the benefit of the doubt, because they trusted him implicitly. Please see the reference to the Big Four Bridge above. It is an interesting coincidence that 15+ years before William Branham was born, there was an accident in which a number of people were killed in a bridge accident one half mile upstream from the municipal bridge. It is likely that any locals might have thought he made a simple mistake and was referring to the wrong bridge. Also, the municipal bridge was renamed in 1949 to the George Rogers Clark Memorial Bridge. The local simply call it the Second Street Bridge. If you look at the "Generation" book by Angel Smith, you will notice that it doesn't appear that any one in that book lived in Jeffersonville in 1929. Those in the book that were locals (very few) were born after 1930 or would have been small children at the time. Also, it appears that a lot of the people in Branham Tabernacle had moved into the area to specifically be close to WMB and so would not have resided in Jeffersonville in 1929. So in 1960, 30 years after the fact, William Branham told the story and no one noticed. As that was the first time on record that he told it in Jeffersonville, it is really not surprising that no one would have questioned him on it. Problem 7: Why didn't William Branham warn anyone? If William Branham knew that people were going to die in the construction of the bridge, why didn't he attempt to warn anyone? Put yourself in William Branham's shoes. What would you have done if you had a vision of 16 men dying in a construction accident on a bridge that they then started building years later. Wouldn't you have warned everyone? This vision is suspect simply because William Branham never attempted to warn anyone. In fact, he seemed quite proud of the fact that he foretold their deaths (which in fact never happened). Are you looking for a simple and easy way to ignore the facts above? If so, this is called cognitive dissonance. It is a term that explains why intelligent people will often settle for answers that are not reasonable, in order to ignore the real issue. If William Branham was young when he had the vision, perhaps he simply forgot it or misremembered it. Kids forget a lot of things and get memories messed up. That would explain why the vision was not fulfilled properly. 1. Why would God give a vision to a child but not give him the ability to remember it? 2. William Branham said that the people that heard him give the vision wrote it down. 3. William Branham said, as an adult, that the vision was fulfilled. The problem is that he is attesting to something that was not true. Why did he say that 16 men died on the bridge, when they didn't? This was the position of Voice of God Recordings until a blog called Searching for Vindication destroyed this as a plausible theory. While it is true that some archives were damaged, complete archived copies of the Jeffersonville Newspapers and the Coast Guard log books remain preserved. Also, does anyone actually believe that the wives, children and parents of the families of 16 men who died would allow their memories to be forgotten? Not in America. This excuse basically says that only one small element of the vision was true - that the vision was fulfilled 22 years after he saw it. But this would mean that virtually everything else about the vision was false. This explanation is only possible if you go beyond the realms of reasonableness (cognitive dissonance again). 16 people were killed in the construction of the bridge. The bridge was opened in March 1932 and if you roll back 22 years, that takes you to about the time that William Branham was born. William Branham never mentioned the Municipal Bridge in the original vision. In the FIRST recorded retelling of the vision in 1948 (48-0302), William Branham specifically refers to the municipal bridge. While 16 people did die in the construction of the Sydney Harbour bridge, only 2 of these people died from falling off the bridge. William Branham clearly stated that he saw 16 people fall from the bridge. William Branham stated that he had the vision when he was 5 or 6 years old, so 22 years later would put the Sydney Bridge deaths much too early in time. William Branham clearly stated that he saw the bridge spanning the river but the Sydney Harbour bridge goes across a narrow part of an inlet (i.e. its over the ocean, not a river). My father was 14 when the bridge opened in 1929, and had sat in the car with his cousin for 12 hours waiting for the ribbon to be cut so they could be the first to drive across the bridge that linked Jeffersonville to Louisville, Kentucky. My father was given a bronze medallion that day at the ceremony to commemorate the bridge opening. I still have that medallion. The story of the bridge collapse was not given to me by my Dad or by Brother Billy, but by my grandmother, Maud, and by a lady named Dorothy Phillips. She was about my dad’s age and went to church with us at St. Luke’s United Church of Christ. She was telling me about being a little girl watching the construction from the river bank. Remember, that although the depression had not “officially” begun, things were not very good economically in Jeffersonville at that time. Many people had no diversions, and spent time watching the construction of this bridge, as I am sure Brother Billy and my dad did as well. Dorothy recalled seeing scaffolding up around the piling in the first water pile, and she recalled it collapsing while there was a major cement pour and she saw men falling into the cement who were never removed. It was a tragedy at the time, and many people were appalled. In a conversation that I had with Jack Vissing he stated that it was his grandmother who had witnessed this as a young girl. If so, this is a clear case of Jack Vissing getting the Big Four bridge confused with the Municipal Bridge. If Jack's father was 14 in 1929, then it is obvious that his grandmother could not have been a young girl at the same time. However, she would have been a young girl in 1895, when the Big Four bridge had 3 different fatal accidents as noted above. Also, the 16 men that died in the construction of the caissons (on two separate occasions) would appear to be very close the description of the accident that she saw. Jack states that "t was a tragedy at the time, and many people were appalled." If this was widespread knowledge at the time it happened, why was it not reported in the local papers? If sixteen men died, how could this be kept secret given the mothers, fathers, siblings and spouses of the people that supposedly died. How would you keep all of them quiet? There were two men who did die in the construction of the municipal bridge and whose deaths made the front page of the Jeffersonville newspaper. The fact that there was no reporting of these deaths argues for it never having happened. Again, we think Jack's grandmother confused this with the death of the men on the Big Four bridge. From an engineering perspective, this story is so implausible it is funny. But that is the lengths that people will go to because of cognitive dissonance. This is a story that is also told of the Hoover Dam. The workers were entombed in concrete but the pour couldn't be stopped and they were left dead in the concrete. The structural integrity of the concrete would fail with even one body ini it, let alone sixteen. The bridge would have crumbled and collapsed a long time ago. The reason for this is that the human body decomposes in concrete and leaves a massive air pocket. Imagine that there are sixteen such large air pockets. The bridge pilon would have collapsed after a few years. Rebar is used extensively in concrete to provide strength. This means there is no room for a single body to be submerged in the concrete. Could sixteen bodies have been submerged? It is impossible. This would have been reported in the engineers' report. We talked on the phone with Jack Vissing and are aware that Voice of God Recordings was a client of his. Would you trust the testimony of a man who was getting paid by the people he was testifying for? William Branham said he was living in Arizona, not Jeffersonville, when the Municipal Bridge was built. When he returned to Jeffersonville on the news of his brother's passing in 1929, the new bridge would have been a significant new landmark. Perhaps he recalled hearing stories of accidents on the Big Four bridge as a child, and confused them with the new bridge that had been built. However, William Branham repeats that he remembered the vision, and that his mother wrote it down - which means he should have been accurate in retelling the vision. If this vision was fabricated, were any other visions fabricated as well? If this was a false prophecy (claimed to be accurate) are there other false prophecies? If you are interested in further detailed research on this vision, you should go to the Searching for Vindication website. And then sometime about a month after that, I was playing marbles out with my little brothers, out in the front yard. And all at once I had a strange feeling come on me. And I stopped and set down aside of a tree. And we were right up on the bank from the Ohio River. And I looked down towards Jeffersonville, and I seen a bridge rise up and go across that, the river, span the river. And I seen sixteen men (I counted them) that dropped off of there and lost their lives on that bridge. I run in real quick and told my mother, and she thought I went to sleep. But they kept it in mind, and twenty-two years from then the Municipal Bridge now (that many of you cross when you cross there) crossed the river at the same place, and sixteen men lost their life building that bridge across the river. William Branham related this same story many times and other ministers have repeated it as the gospel truth. The Louisville Municipal Bridge opened to the public as a toll bridge on October 31, 1929. It was renamed the George Rogers Clark Memorial bridge in 1949, but is known locally as the Second Street Bridge. The Municipal Bridge crosses the Ohio River between Jeffersonville, Indiana and Louisville, Kentucky. A half mile east is the Big Four railway bridge. Construction on the Big Four Bridge started in 1888. 12 men were drowned while working on a pier foundation and another 4 men died when a wooden beam broke. In late 1893, 41 men fell from the bridge when a truss fell into the river. 20 of these men were rescued while the other 21 perished in the river. This was one of the worst bridge disasters in US history. However, there is no record of anyone being killed in the construction of the Municipal Bridge or of 16 men falling to their death from that bridge. 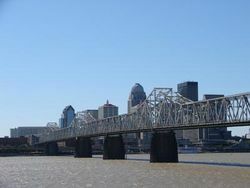 The Big Four Bridge was the ONLY Louisville Bridge with serious accidents during its construction, and these accidents all occurred long before William Branham was born. Not a single person died during the building of the Municipal Bridge. Based on William Branham’s testimony, he had the vision 22 years before the bridge opened, which means he had it before he was born. And William Branham consistently retells this prophecy indicating it was fulfilled exactly as he saw it when, in fact, the event never happened. If you have any additional facts relating to the subject of this video information, please contact us. And about four days after that, it appeared to me and a strange feeling came upon me, as it always does, and I seen the municipal bridge, at Jeffersonville, cross, come up out of the wilderness on the hill where I was standing, and crossed the river. I seen sixteen men fall off of it. They put that down and twenty-two years from that day, the municipal bridge spanned the river at the same place and sixteen men lost their life on it. And just things like that. It's nothing I can do in myself. It's just what He shows me, is all I can speak. Only thing that any true man of God could ever say, but what God would put in his mouth to say. Outside of that, it would totally be a failure. And when It met me, many times, and told many things which I probably get a chance after while, to tell you in one of the meetings. And my little brother and I, a few days later from that was setting out under the tree. We'd been playing marbles. And I felt a peculiar feeling, like a... Something was standing near me. And all at once, something happened. I set down. And I looked, and I seen coming up out of the river a big bridge, spanned across the river, and sixteen people fell off of it. I went and told them. They said, "Why, you dreamed." I Said, "No, I looked at it. I seen it." Twenty-two years from that time, the big Municipal bridge spanned across the Ohio River, and sixteen men lost their life on it. And it just started like that, and begin... That was before I was ever even a Christian. My people wasn't Christian. Gifts and callings are without repentance. It's a foreordination of God. Then It kept telling things on down. Then a few days after that, setting... That was my first vision, setting out there under a big silver poplar tree in the front yard, where the tree stands yet today... Standing out there in the front of that place, I seen Something, like yesterday afternoon, I seen Him coming upon me, that I never... I didn't know what it was. In a little bit I moved off, and I looked, and I seen moving up out of those bushes down by the river, and along there came a big bridge, and it spanned across the river. I seen men dropping off of it and losing their lives. And I went in and told mama. She said, "Honey, you went to sleep." I said, "Mama, I was not asleep." I said, "I was setting there. I had a funny feeling, mama." I said, "Oh, I'm scared, mama. What's the matter with me?" She said, "Oh, you're just nervous, honey." I said, "Mama, something... I don't want to feel this way." And it was Something moving. And just... She wrote it down. And twenty-two years from that time, the Municipal Bridge which spans the Ohio River run across at the same place, and the same amount of men dropped off the bridge and lost their lives, just exactly. So then, I remember about two weeks after that, I was playing marble with my brother, and there I--I felt something strange come over me. I didn't know what was taking place. And I went out, set down just a minute, and I looked, and right before me, I seen something moving. And the waters looked like the river was looking closer to me. And I seen the Municipal bridge that spans the river now, come up and cross the river, and seen the amount of men dropped off, and went in and told my mama. She said, "You had a dream, honey." I said, "No, ma'am. I stood and looked right at it, and I seen what it did." At the age of just a little bitty boy, I could remember He speaking to me and telling me about a bridge that was going to span the river, how many men would lose their life on that bridge. And they wrote it down to see what it was all about. They thought I was dreaming. I was out in the yard, just something come over me, and I set down. I seen it. And I went and told mother, she said, "You went to sleep, honey." I said, "No, ma'am, I never went to sleep. I stood and watched It come up out of the bushes." And twenty-two years from that time, the Municipal Bridge span across the Ohio River, and the same sixteen men lost their live on it, just like It said. See? And it's always been that way. And Christian friends, to the best of my soul, I say this for God's glory: I have never seen one time but what it was just as perfect, just exactly the way It said it would be. A little later on, about two weeks later I was playing marbles with my brother, and I felt something come to me. We lived up on a hill, and the river was below us: a wilderness around. And I saw a bridge come up out of the wilderness. And it started across the river. Sixteen men dropped off in--into the water and perished. And I seen a big sign, it said "twenty-two years." I run in and told my mother. Oh, she said, "Son, you're nervous. You went to sleep and you were dreaming." I said, "No. No. I saw it." So they wrote it down on a piece of paper. And twenty-two years from then, the great bridge crossed the river, and twen--sixteen men dropped off of it and--and drowned in the river. Every time, it's perfect. Then two--about two weeks from then, I was playing marbles with my brother, and Something come upon me, and I looked down at the river. And I saw a great bridge span the river, and I watched sixteen men drop off of it and lose their lives. When It left me, I ran in to my mother and I told her. "Oh," she said, "honey, you was dreaming." But I wasn't. But she wrote it down. And twenty-two years from that day, the Municipal Bridge spanned the river at the same place, and sixteen men lost their life on it. It just kept coming all the time, like that. Just even you take this big bridge down here, when I saw it come twenty-two years before it was put up down there, saw the men lose their lives on it. When they put the bridge across there and spoke of it. My mother wanted to take me to the doctor, thought I was having nervous spasms. And I told her; I said, "I seen a bridge go across, and I counted them men." Twenty-two years after that, the bridge went across, and the same amount of men lost their lives. I think it was sixteen, exactly. Now, I thought, when they put those big girders up there, "My, that bridge will last forever." Oh, they've painted it three or four times, and it's rusting down right now. What is it? The rays in the air burned it up. Certain things happened. When I was a little boy He spoke to me, He said, "Don't never smoke or drink, or defile your body. There's a work for you to do when I get--when you get older." It's in the book back there. You may read it. And my mother and them, they thought I was just nervous. And then It went ahead, and two days--three days after that told how that bridge would cross the river just below our place now. Sixteen men would lose their life on it. And they wrote it down. And twenty-two years from then it happened just exactly, and sixteen men lost their life. It's never been, out of the thousands of things, but what it's been perfectly right. See? That's right. See, things happen when you're a child, that impresses. A week after that, I seen the Municipal Bridge, in a trance, as I called it, seen the Municipal Bridge cross the Ohio River, seen sixteen man lose their life on it. Twenty-two years from that day, the Municipal Bridge crosses the same place, and sixteen man lost their life in it. We find out, next day after that, He showed me a bridge crossing the river, spanning it, showed sixteen man drop off of it. I told mama. Sitting against a tree, looked at it. She said, "You went to sleep, honey." I said, "No, I never, mama. I watched it." Exactly seventeen years from that day, the Municipal Bridge at Jeffersonville spanned over to Kentucky, and the seventh... And the sixteen man lost their life on it, just exactly like it said. Ah, so did Mr. Unbeliever has tempted me all along! Allgeier, M.A. (1983). Louisville Municipal Bridge, Pylons, and Administrative Building, Louisville Landmarks Commission. The Encyclopedia of Louisville (1 ed.). 2001. Luhan, Gregory A. (2004). Louisville Guide, Princeton Architectural Press. The Jeffersonville Evening News reported two deaths on its front page on Thursday, June 30, 1929. One death was Edward Branham, William Branham's brother, who died of rheumatism of the heart. The second death was Richard Pilton, the first fatality during the construction of the Bridge, who died when an iron crank he was using struck him in the temple. This page was last edited on 21 October 2018, at 17:23.